It’s a feature of the health pages that never seems to go away. Vitamin D. Every day, you can half-interestingly scan the lifestyle sections of papers and you’ll find it in there somewhere. Our sedentary, indoors lifestyles can mean that we’re not getting enough of it. Or we could be taking calcium supplements without taking the vitamin D necessary to help us absorb the calcium (calcium on its own isn’t enough). So let’s clear it up once and for all, exactly what it is and why we need it. 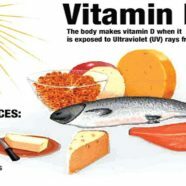 This is particularly timely, given that evidence is increasing, pointing to the fact that Vitamin D, the ‘sunshine vitamin’, can ward against a variety of ailments. Gay massage may be the key to relaxation, but vitamin D can help us stave off an array of cancers, diminish the likelihood of getting rheumatoid arthritis, keep us safe from colds and influenza and even spare us the ravages of multiple sclerosis. Confronted with a list like that, who wouldn’t want to start popping it in supplement form or start booking the next available sunshine holiday? This miracle vitamin isn’t just one thing. Like vitamin B, it comes in several forms. For example, there’s vitamin D2 (available in yeast and fungi) and vitamin D3 (which we get when sunlight makes contact with our skin). Once vitamin D is in our system, it turns into a steroid that starts travelling around in our blood circulation. It sets to work on keeping our bones and teeth in good condition, as well as enhancing our muscle strength. Provided we’re getting calcium somewhere in our diets (or via supplements), the vitamin D will help us process it. What can happen if you don’t get enough Vitamin D? If we’re not getting enough vitamin D, we’ll eventually discover this to our detriment. Rickets and other skeletal disorders are the result of vitamin D deficiency. In fact, rickets, once thought of as something we left in the Dickensian era, is making a comeback as modern-day poverty takes its terrible toll on the nation’s nutritional standards. The newer claims relating to vitamin D (multiple sclerosis prevention and reduction in cancers) are more controversial, but evidence for them is growing. Vitamin D does appear to have anti-cancer properties and staff working in molecular endocrinology at the University of Birmingham back this up. The evidence, however, relates to cancer cells studied outside the body. The picture becomes less clear when the studies involve humans. Most experts conclude that while vitamin D can help prevent some ailments (respiratory infections, autoimmune diseases), it cannot be used to fight them once they’ve settled in. Supplements can be useful because the amount of vitamin D acquired from sunlight depends not only on our exposure to it, but also genetics, skin colour and clothing. During winter and autumn, it’s advised that we bolster our intake not only with supplements but also with vitamin D-rich foods. The trouble is that these are scare, especially if you’re a vegetarian or vegan and therefore not likely to eat mackerel (one of the vitamin D-containing foods). So the next time you’re on the way to a gay massage London appointment, be sure to wear a t-shirt and let the sunshine work its magic.